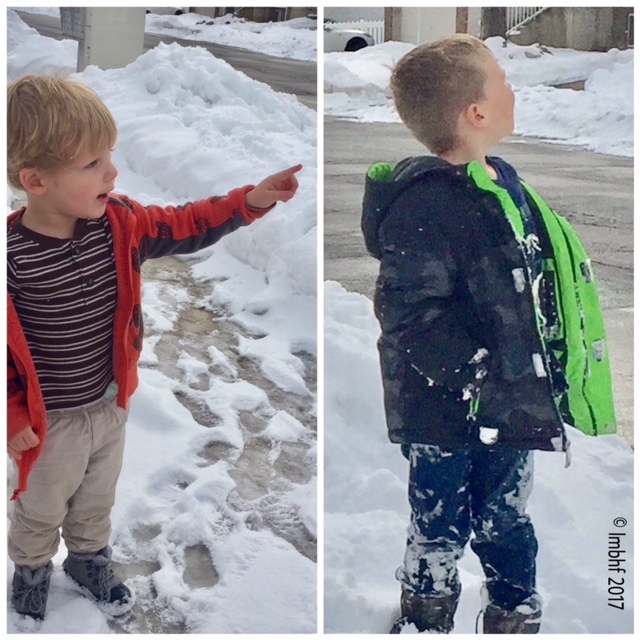 February 1, 2017|Posted in: Crafter's Corner, Happy, Healthy, Smart Kids! 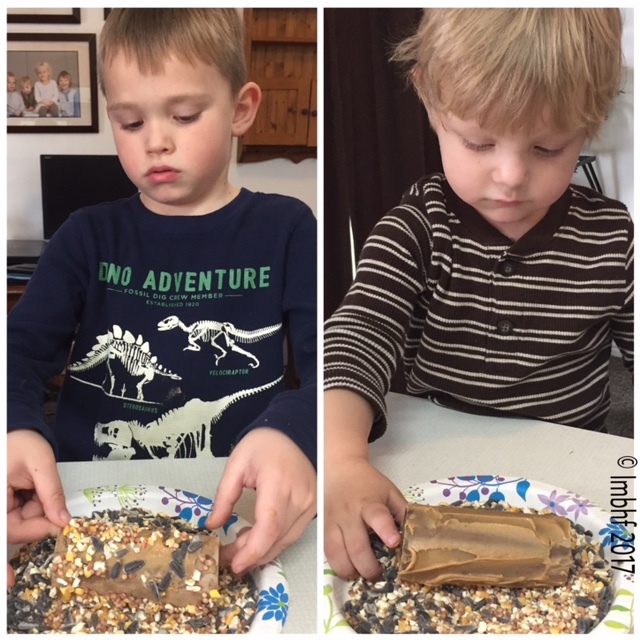 My grandsons and I had so much fun with this project! We made our very own bird feeders! With all the snow we’ve had here in Utah this winter I think the birds appreciated it too. If you’re looking for a quick, easy and enjoyable project you can do with the kiddos, look no farther – you’ve found it! 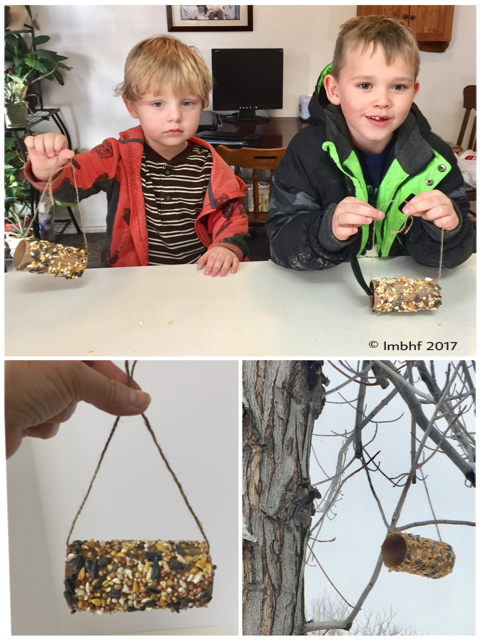 This first picture shows the boys with their finished bird feeders just before we took them outside to hang them in a tree. The bottom two pics are closeup of what the finished product looks like. You’ll also need butter knives or plastic knives for spreading the peanutbutter, scissors to cut the stringand a plate to hold the birdseed. Once you’ve gathered all your supplies, you’re ready to get started with the project! 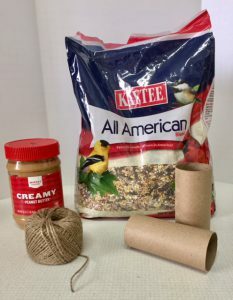 Spread peanut butter all over the outside of your empty TP rolls, just thick enough to hold the seeds. My little guys did a great job spreading peanut butter, and then Gramma helped out a bit by filling in the few spots they’d missed. 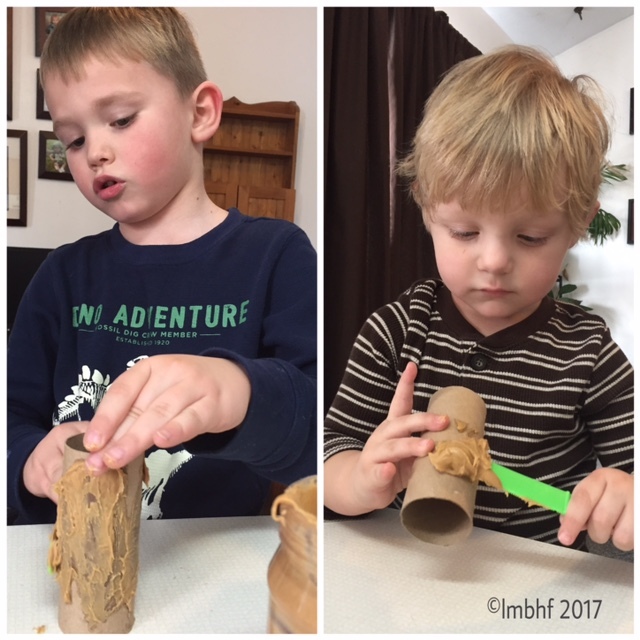 Spreading peanut butter on the TP rolls. Fill a plate (I used a paper one) with bird seed, about 1/4 inch deep. Roll your TP tubes covered in peanut butter in the bird seed until the seeds completely cover the peanut butter. Rolling their tubes in the bird seed. Take a piece of twine, string or yarn and cut it to a length of about 18 to 20″. Thread it through the center and tie together with a know at the ends. Hang your bird feeders outside in a tree or some other spot that is accessable to birds. G2, is a big six year old, and Mr. Independent, so he had to hang his himself. G4 is only two and a half so he was willing to let Gramma help him. Watch for birds to come and feed! This project was so much fun to make! But most importantly, my grandsons and I made a special treasured memory, one that we can have forever! 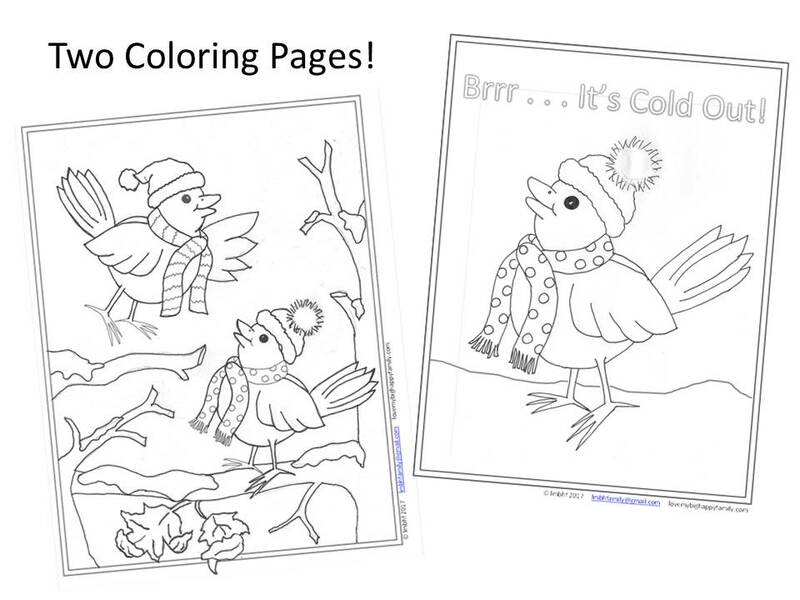 If you’d like our fun and free coloring page, “Feathered Friends Enjoying Winter,” you can Get It HERE. My grandsons have done the same craft. They had a great time making their bird feeders. Thanks for linking up with Blogging Grandmothers. 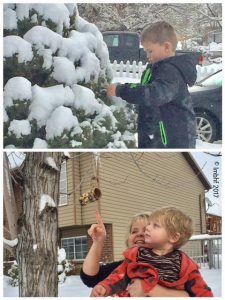 what a cute idea – and I love seeing pictures of families in the snow – we’re in Australia and it’s hot and sunny here (I’m sure the birds would still appreciate a peanut butter and seed treat though). Yes, I’m sure the birds would enjoy it regardless of the weather! What a neat project for the grandbabies! I know your handsome grandsons enjoyed it. Thank you Lori for sharing at #BloggingGrandmothers #LinkUp #BlogParty. I shared on social media. What a great way to spend an afternoon with the grands. My grandson would love this. Thank you for sharing with Blogging Grandmothers. I have posted on my social media.